Of the three major Arab participants in the Six-Day War, Jordan by far had the smallest armed forces and the most to lose in the event of an Israeli victory. Stung by accusations that he did not support the Arab cause and had ignored the plight of the Palestinians, King Hussein aligned his small country with the regime’s bitter enemies in Cairo and Damascus, ultimately plunging the kingdom into disaster. Hussein faced a difficult political situation in the mid-1960’s. The Arab Legion, the precursor of the Royal Jordanian Army, had been the only Arab force to hold Palestinian territory in 1948 against the Israelis. The Hashemite royal dynasty had long supported Arab unity, and a potent Egyptian-inspired propaganda campaign had made support for the Palestinian cause the litmus test for Arab leaders. In 1964 Hussein approved formation of the Palestine Liberation Organization with the provision that it would never assert political control of the West Bank, the part of Palestine controlled by Jordan. The West Bank, though geographically much smaller than the East Bank (Jordan’s present territory), held roughly half of the kingdom’s population and dominated its vital agricultural sector and small industrial economy. The Jordanians had to defend it; pulling back to the strong defensive line offered by the River Jordan was therefore not an option. The Royal Jordanian Army had been “Arabized” starting in 1956, when its large cadre of British officers were released from service, but in 1967 it still carried many of the professional traditions of the old Arab Legion on which it was based. Bedouin Arabs formed between 30 and 40 percent of the personnel and were considered both tough fighters and utterly loyal to the Hashemite dynasty. Palestinians, considered unreliable and not particular good in battle, made up about the same percentage, with the remainder coming from so-called “town Arabs” and religious or ethnic minorities like Christians and Circassians. Jordan’s general staff had planned to open a war with Israel by executing Operation Tariq, designed to isolate Jerusalem from the rest of Israel. The 40th Armored Brigade would strike from the north and the 60th Armored Brigade from the south, while Jordanian infantry stormed key Israeli positions around the holy city. A Royal Jordanian M48 Patton tank. 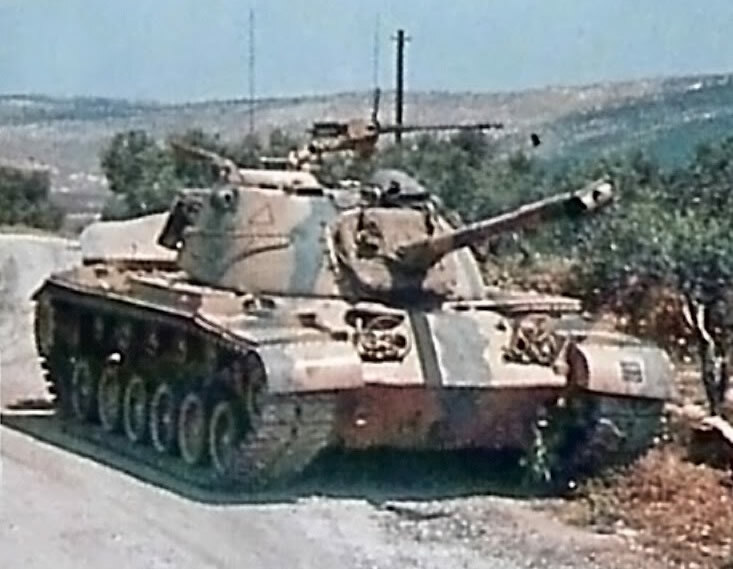 Each armored brigade included two battalions (“regiments” in the British parlance still used by the Jordanians) of new American-made M47 or M48 Patton tanks, and one of mechanized infantry in new M113 armored personnel carriers. And they had the pick of the army’s personnel. Two independent tank battalions (“regiments”) of Centurions supported the seven infantry brigades deployed on the West Bank. Jordanian staff officers were under no illusion that they could defeat the Israelis, but with a successful Operation Tariq to divert Israeli efforts and significant reinforcements from other Arab states, they believed they could hold the West Bank for several weeks, long enough to extract a favorable peace settlement. But that was not to be. The Jordanians detected Israeli preparations for war and were ready when the Israelis struck Egypt, but promptly fell victim to Egyptian lies. Jordanian radar operators detected large number of aircraft over Israeli airfields; the Egyptians claimed that the Israeli Air Force had been destroyed and these images were of Egyptian planes attacking Israel when they were actually Israeli planes returning from attacks on Egypt, refueling and rearming, and sortieing again. Egypt’s commander-in-chief, Field Marshal Abdel Hakim Amer, instructed the commander of the Eastern Front (meaning Jordan and the expected Arab allied formations), Gen. Abdul Munim Riyad, to open fire with artillery and machine guns on Israeli positions. Riyad, an Egyptian general, had been Amer’s second-in-command until only a few days before and felt compelled to follow his orders, though the arrangements of the Unified Arab Command were not particularly unified and it is not clear that Amer actually had such authority over Riyad. But Riyad obeyed his old boss, and the Jordanians ended Israeli uncertainty over the kingdom’s stance with a useless display of firepower starting at 0945 on 5 June. Amer also ordered Riyad to move the 60th Armored Brigade south to advance into the Negev Desert of southern Israel and link up with the advancing, victorious Egyptian 6th Mechanized Division. In reality, the 6th Mechanized had been defeated by the Israelis and begun a disordered retreat. Riyad dutifully issued the orders, over the furious opposition of his Jordanian staff, and ordered the 40th Armored Brigade to shift southward to take over the positions of the 60th. Meanwhile, the tiny Royal Jordanian Air Force took to the skies to attack Israeli targets. They met no opposition whatsoever, reinforcing Egyptian claims of an aerial victory. They managed to bomb an abandoned Israeli airfield, destroying one out-of-service plane still here, and also attacked a beachside resort, thankfully empty because of the war. Iraqi planes followed up, but could not find Tel Aviv and dropped their bombs on an Israeli farm instead. The Israeli Air Force repaid the visits at noon, destroying 20 of Jordan’s 22 operational Hawker Hunter jets and knocking out Jordan’s radar. Five American-built F104 interceptors had just arrived at Amman’s International Airport but had not yet been turned over to the Jordanians; when word came that war had broken out, the American transfer pilots immediately took off and flew the planes to Turkey. 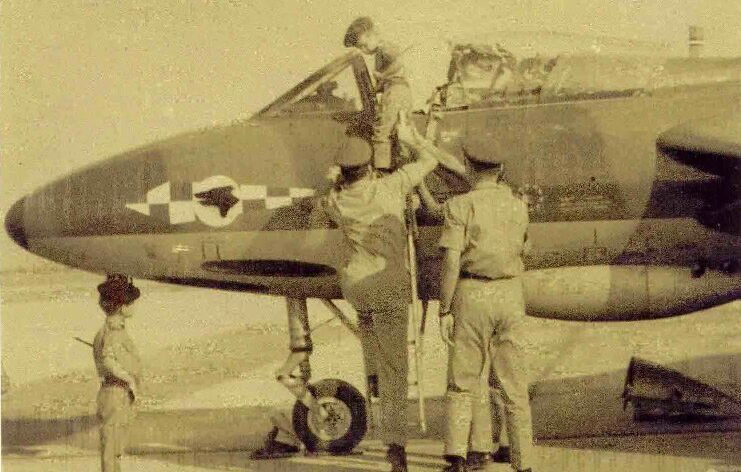 Saiful Azam shows Jordan’s Crown Prince Abdullah his Hawker Hunter. Half an hour later the Israelis struck the Al-Walid Airbase in Iraq, also known as H-3. They destroyed most of the planes stationed there, but Pakistani pilot Saiful Azam shot down two Super Mystére jets while still a member of the Royal Jordanian Air Force. He transferred to Iraqi service the next morning and shot down two Vatour bombers, bringing him to ace status while flying for three air forces (he had shot down an Indian Air Force fighter during the 1965 Indo-Pakistani War). Aside from Azam, the Iraqi Air Force could show little success: the Israelis shot down 21 of the Iraqi fighters that rose to meet them. The Israelis had planned a holding action in case of war with Jordan, Syria and Egypt, but with the Egyptian Air Force destroyed and Syria remaining quiet the Israeli leadership decided to seize the opportunity and conquer the West Bank. They shifted an ugdah south from the Golan front to invade the West Bank from the north, and began their own pincer movement to envelop Jerusalem from the south. With the Egyptian Army already crumbling, the Israelis also transferred a crack parachute brigade from northern Sinai to the effort against Jerusalem. Unlike the Sinai front, fighting developed slowly on the West Bank as neither side seemed fully committed to war. As the morning went on the Jordanian 3rd “King Talal” and 27th “Imam Ali” brigades became involved in ever-intensifying combat in and around Jerusalem with the oversized Israeli 16th “Etzioni” Brigade. The Israelis pushed back initial Jordanian advances and began to clear the fortified positions known as the Sausage and the Bell. As on the Sinai front, the Jordanians resisted fiercely from their positions but would not re-orient themselves when outflanked nor would they counter-attack to restore lost trenches. 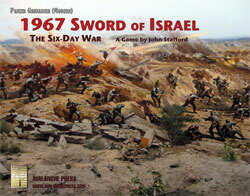 Note: Sword of Israel Scenarios 24 through 27 are based on these battles. The Israelis had hoped to avoid war with Jordan and concentrate their forces against Egypt, and this prevented Gen. Uzi Narkiss, commander of their Central Front, from forming concrete plans as he could not be sure what forces would be available beyond the Etzioni Brigade. The Israelis made quiet overtures to Jordan throughout the morning, but fearing the wrath of the Arab world King Hussein replied that “the die is cast.” With last-minute peace not in the cards, Narkiss had free reign to launch the offensive he had planned on the fly.